In the coming weeks, NFL training camps will officially commence. Afterwards, the preseason will begin and then we will finally be able to hail in the 2018 online NFL betting season. Naturally, players learning how to bet NFL online will be looking to use this time to prepare for the upcoming season. To help them out, we’re taking a look at some divisional predictions for this upcoming season. On the menu for today is the NFC North. So, without further ado, let’s take a look at our 2018 NFC North predictions. Coming off a massively disappointing season, the Packers cannot wait for this upcoming season to start. Aaron Rodgers went down with injury last season and there’s no question that he’s eyeing up 2018 as a revenge tour. And the one team at the top of the list will be the Minnesota Vikings, who were the ones to injure him in the first place. So what can we expect out of the Pack this upcoming season? All in all, we can expect them to win the division. 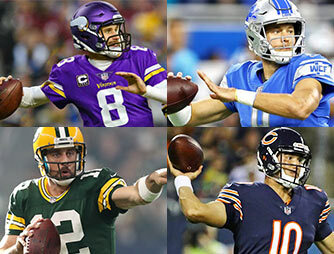 The Vikings, last year’s divisional winner, have undergone some changes at quarterback and there’s no guarantee that Kirk Cousins will be able to lead them to an NFC North title. And since Green Bay made a handful of coaching changes during the offseason, you can expect Rodgers to have a defense behind him this time around. The last time that was the case Rodgers lead this team to a Super Bowl victory. Coming off a 9-7 season, the Lions are hopeful that they can build on last year’s success. All in all, the Lions really missed the ball last season. Since Rodgers went down with an injury, the NFC North was wide open. But instead of rising up to the challenge, Detroit failed to get the job done late in the season. Moving forward, Detroit has now brought along new head coach Matt Patricia. Patricia is coming off a 13-year stint with the New England Patriots – so there’s no questioning his credentials. However, as a 1st time head coach, there’s no guarantee that Patricia will lead this team to a winning record. However, the Lions have enough talented pieces in place for Patricia to come in and find success in 2018. Matt Stafford is one of the best in the league and the Lions have plenty of coveted defensive players. Don’t be afraid to take a chance on Detroit this upcoming season. The Vikings may be coming off a highly successful 13-3 season, but there’s no guarantee that Minnesota will be competitive in the division next season. The reason being, how poorly they fared in the NFC Championship game. Although they were paired against the eventual Super Bowl champions, Minnesota’s 7-38 losing performance lets them know just how well they rank against the NFL elite. And while the addition of Kirk Cousins is promising, Cousins isn’t a preferable choice over Rodgers or Stafford. In a league determined by quarterback play, it’s looking like Minnesota could come up short in 2018. They do have a great defense which could support a struggling Cousins. Having said that, it’s clear this could be the most volatile of our 2018 NFC North predictions. The Chicago Bears are coming off a disappointing 5-11 season. Although they have talent across the board, it seems that John Fox was incapable of leading this team to any sort of success. Subsequently, Fox has been replaced with Matt Nagy. Nagy has spent time with the Kansas City Chiefs in the last 4 years and with the Philadelphia Eagles before that. While the Chiefs were great last season, they failed to maintain consistency towards the end of the year. Therefore, bettors shouldn’t expect much out of Nagy or the Bears this online betting season.